Thanks to Moneil Patel, USC Keck School of Medicine, California (USA), for contributing this case. To contribute a Case of the Week, follow the guidelines on our Case of the Week page. (1) We have now updated the Bladder and Cervix-Cytology chapters. Thanks to the reviewers listed at the top of each chapter for their help. (2) We posted an article on our Management Page, 5010 Billing and ICD10 Coding Conversion, by Leigh Polk, PSA, LLC, click here. 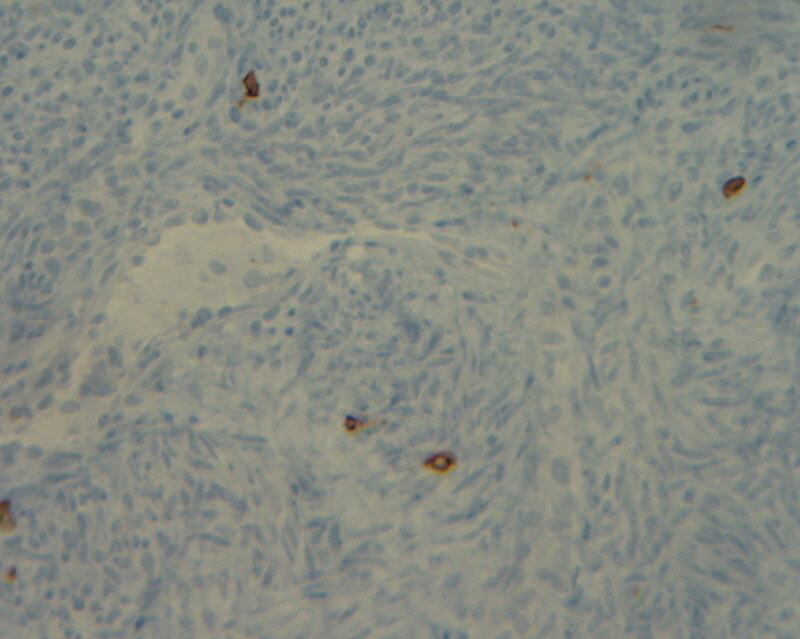 We have also added a section on Coding, with the first article about coding thyroid FNAs. (3) Dr. Adela Cimic, Wake Forest University, North Carolina (USA) gave us this tip on sharing slides using Skype: Use the Skype feature called "screen share", and if your microscope has an attached camera, you can share slides with other pathologists for consulting or teaching purposes. 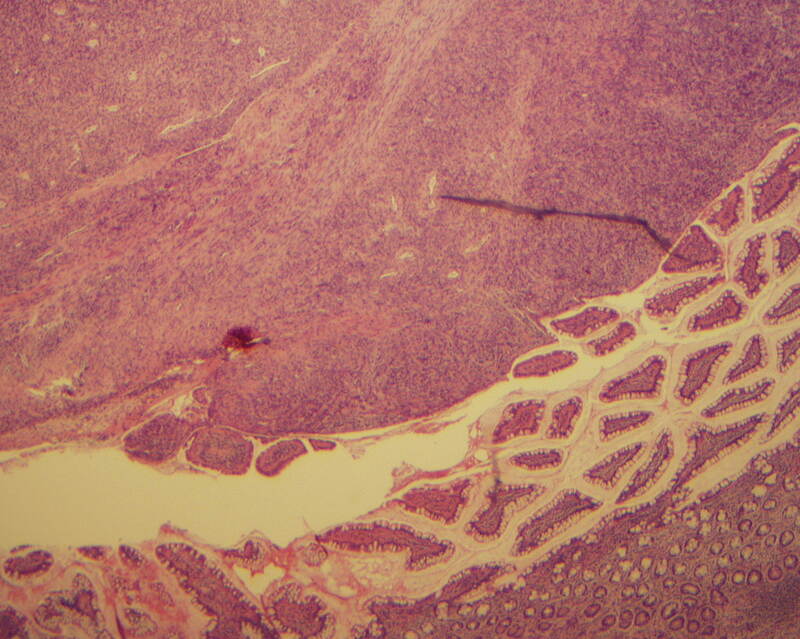 "I did it when I was in Europe and I shared slides with a pathologist in the USA. The picture quality is good." A 2 year old girl with a history of liver and small bowel transplants presented with small bowel obstruction. Abdominal exploration revealed multiple masses within the lumen, submucosa and mesentary of the transplanted bowel. The masses were resected. Epstein-Barr virus (EBV) associated smooth muscle tumors are rare lesions that occur in immunocompromised patients (Am J Surg Pathol 2006;30:75). The immunodeficiency may be genetic or due to AIDS (Patholog Res Int 2011;2011:561548), post-transplant (J Heart Lung Transplant 2009;28:1217, Clin Cancer Res 2009;15:5350) or other immunosuppressive therapy. 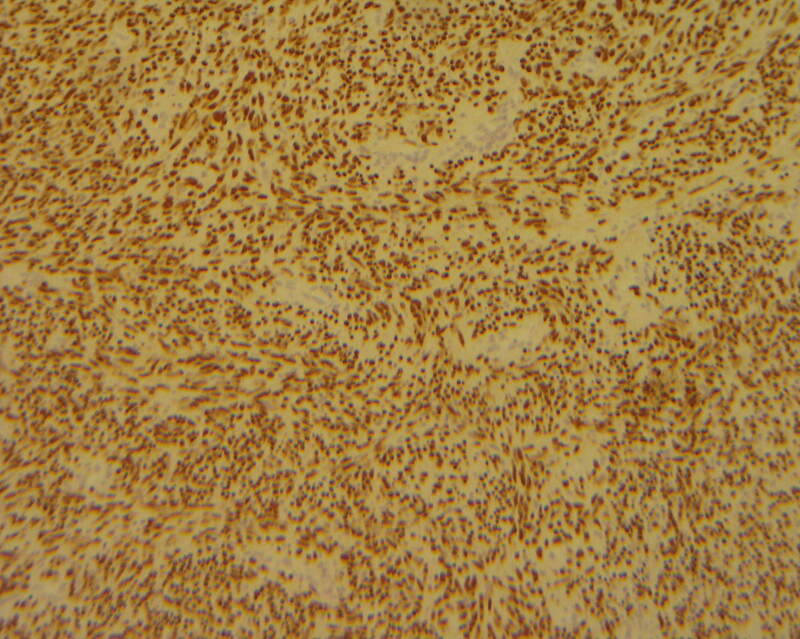 These neoplasms usually have a clonal EBV genome (N Engl J Med 1995;332:19). 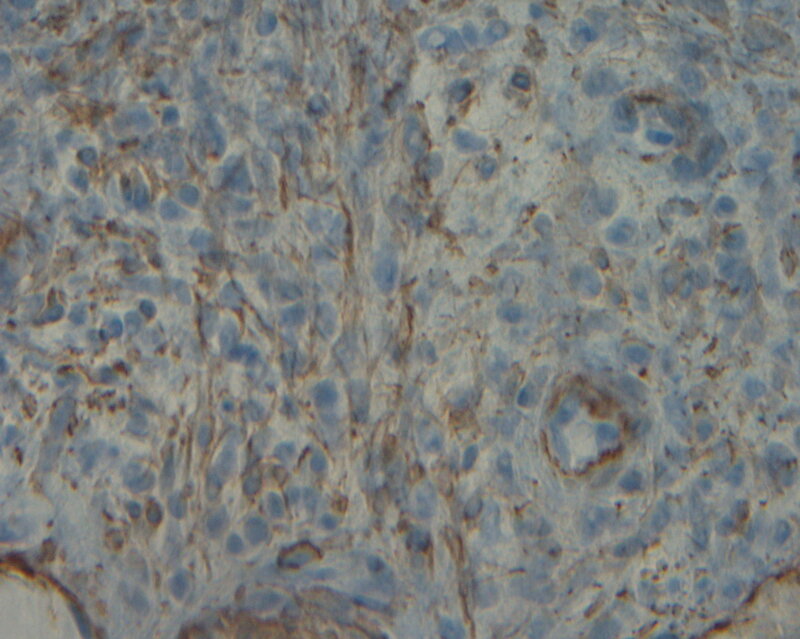 Histologic features do not correlate with clinical outcome. Multiple tumors appear to be clonally distinct, suggesting that they arise from multiple infection events, not as metastases. 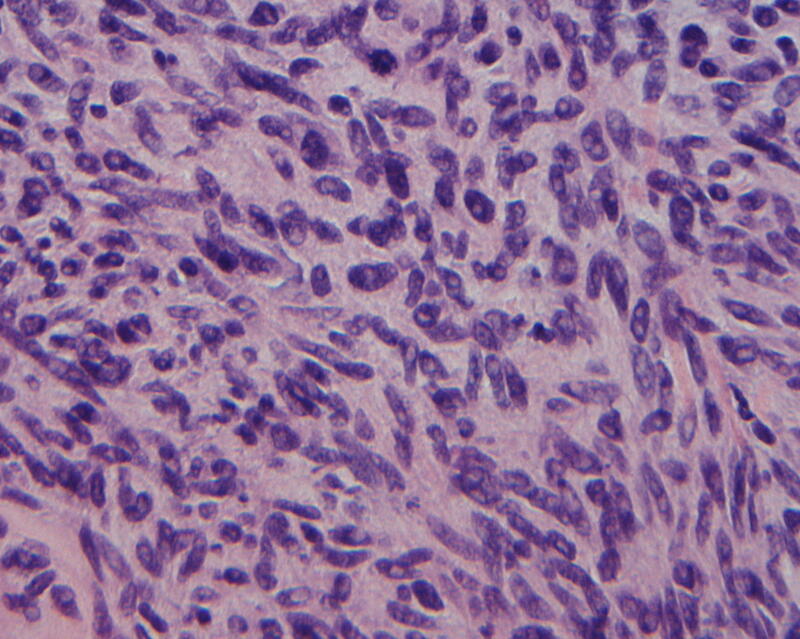 The differential diagnosis includes leiomyoma and leiomyosarcoma. 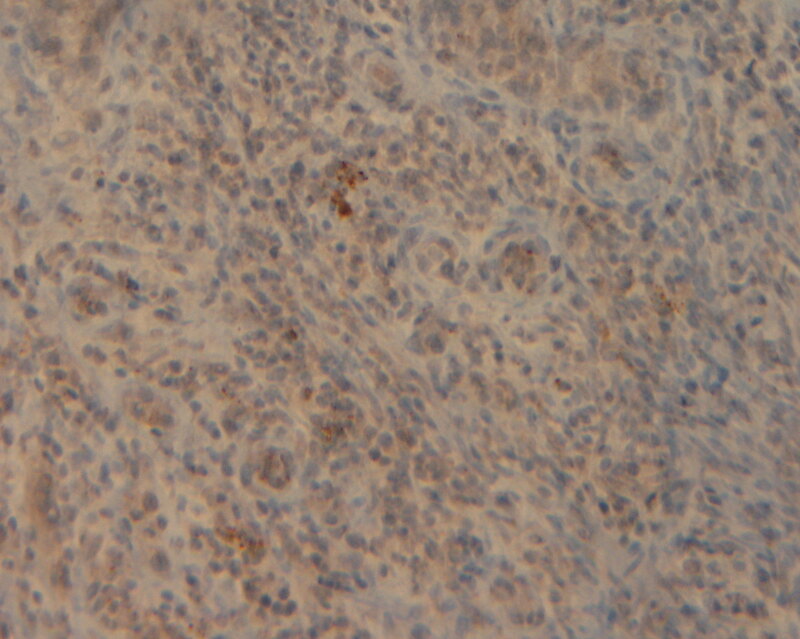 These tumors are EBER negative, and if associated with immunosuppression, EBV must be ruled out by immunohistochemistry, ISH or PCR. Treatment is poorly defined. Typically, it consists of primary resection, with occasional radiotherapy, chemotherapy, HAART for AIDS patients, or withdrawal of immunosuppression (Sarcoma 2008;2008:859407). These tumors are usually indolent, but deaths have been reported.